However, as my TBR pile grows, I’m coming to the conclusion that I simply shouldn’t waste my time on books that I don’t enjoy. If I do, I’ll never get around to trying Georgette Heyer, Barbara Pym, or Penelope Fitzgerald; I’ll never finish working my way through Thomas Hardy’s body of work (and then going back through them all again). I’ll never have time to reread my beloved Austens, Tolkiens, Sayers, or (lest you think I’m a dreadful snob) my Gunslinger books by Stephen King. So, even though The Memory Keeper’s Daughter is proving to be a quick read (I read the first fourth of the book in a little over a hour), I’m just not going to spend any more time on it. Now, I will say that it’s not a terrible book—it’s not nearly as annoying as Outlander. If I were reading it for book club, I would finish it and wouldn’t be totally cranky about it. But, still, it’s not for me. The doctor was then intent on delivering the placentas, which came out beautifully, dark and thick, each the size of a small plate. Fraternal twins, male and female, one visibly perfect and the other marked by an extra chromosome in every cell of her body. What were the odds of that? His son lay in the carrier, his hands waving now and then, fluid and random with the quick, water motions of the womb. Okay, I’m not easily grossed out, but the word placenta and plate do not belong in the same sentence, ever. And then there’s the nurse: “Caroline Gill was thirty-one, and she had been waiting a long time for her real life to begin.” Okay, lady, you’re thirty-one—you’re living your real life. But apparently she needs a baby for real life to begin. Also, a truck driver who appears out of nowhere—twice. Whatever. And Edwards feels compelled to explain everyone’s feelings because these people are so inscrutable. Only they’re not. Clearly, I am not the intended audience for this book. This kind of thing just doesn’t appeal to me. But lots of other people have loved this book, and I’m glad that it will be going off to a better home with amandasue, who won my copy in my “What Should I Read in October?” giveaway. Amandasue, I really hope you enjoy it more than I did. But, hey, there’s one more off my bookshelf, and I’ve crossed a hurdle in my bookish life! So hooray! This entry was posted in Abandoned, Fiction. Bookmark the permalink. The older I get the more open I am to giving up on a book. Sometimes it happens halfway through, other times before the first chapter is over. I want to be wowed, I want to be absorbed, and if it’s not happening, well, often I just don’t have the time. 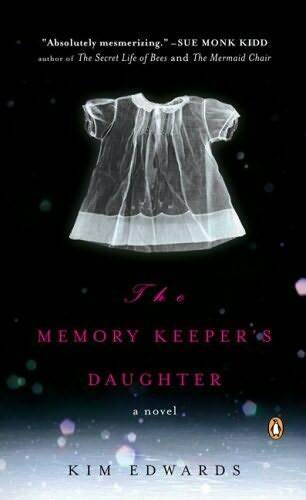 Memory Keeper’s Daughter was a book I finished but wasn’t thrilled with overall. You’re not missing anything. I read the book and it wasn’t memorable but I liked it. Do you like classic mystery novels?? I loved Poirot and read all those Agatha Cristie novels.Also I recommend the MidSomer Murder novels,they are more modern but darn good reads! Congratulations on your first abandonment! And that was a bang-up review, too. You and I not only love the same books, we hate the same books. Thanks for the laugh, and the unrecommendation. Fabulous, as always, review on this one. At least once a week someone has to be telling me about this book, but I feel just in the description that it’s not really for me. Also, I suppose congratulations are in order for your book abandonment. I had a terrible time abandoning my first book, but ultimately it was worth spending the time with a different novel! O my. I had to read this for a book club and just DID NOT like it. I think you read the best part of the book which isn’t saying much…it just goes down from there. Horribly annoying characters…but that’s just my opinion. Tara: Yep, as I’m getting older, I’m losing patience with bad books. I think it was Nancy Perl (Book Lust) who suggested a formula for how much of a book to read that invloved subtracting your age from 100 and reading that many pages. I’m glad to know I wasn’t missing much with this one! Rachel: I do like classic mysteries. I haven’t read any Agatha Christie in ages but I have fond memories of performing in plays of Ten Little Indians (aka And Then There Were None) and The Unexpected Guest. The Midsomer Murders are among the series I’ve been meaning to check out (along with Morse and Maigret). Jenny: Ha! Somehow the negative reviews are more fun to write—I get to bring on the snark. But since I try to be choosy from the get go, I rarely read something so snark worthy. Amanda: I breathe a sigh of relief that I saved myself from even worse writing than the first 100 pages. I’ve had enough books turn around once I’m well into them (as, for example, The Lost Dog did at page 50), that I’m always afraid I’ll miss something great. I read that one and I thought it was very slow going and not at all one of my favorites. I expected to like it and was disappointed. Sorry to hear you didn’t like this one. Sounds like I might not either. And you’re not alone in not enjoying The Amber Spyglass! I gave up halfway through that one, which is a bad sign considering it was the conclusion of a trilogy. But by then I just didn’t care what happened at the end. I wasn’t annoyed while reading The Memory Keeper’s Daughter, but I think you make some good points, even if they were kind of minor as far as my reading experience went. What I loved about your review was the mention of Ruth Rendell and what she would have done with the premise. Well, yeah. Thinking of that will make almost any mystery plot pale in comparison! Elizabeth: I found the actual reading went pretty quickly, but that’s partly because I started skimming after about 50 pages because I was hoping it would get good. Jeanne: Yeah, I think my problem was that I was expecting an entirely different kind of book. It’s amazing how expectations can affect how you feel about what you read. Maybe I would have liked this more had I been expecting something more sentimental than dark. After torturing myself by reading all 600+ pages of Doris Lessing’s “The Golden Notebook” (and it was torture. I read a book or two a week and that one took me over a month because I kept falling asleep) I told myself to stop wasting time on books I’m not enjoying. I’m totally with you on that one! I don’t feel too bad about it because I know that someone somewhere is enjoying the book; it’s just not for me. Fabulous review! I did actually LOVE this book, but I think your review is fantastic. I love this line: “Okay, I’m not easily grossed out, but the word placenta and plate do not belong in the same sentence, ever.” I did despise OUTLANDER, and I am not opposed to giving up books, more and more as I get older. The most recent one was The Ten-Year Nap. I keep picking this book and reading the back cover. Every time I do, I know I would not like the book. I wish I would remember that the next time I see it. Maybe your memorable review will help.